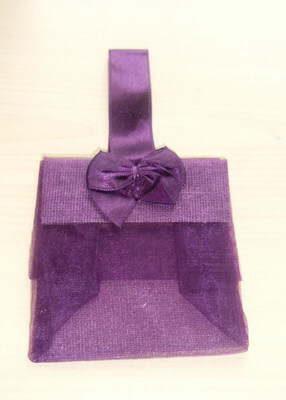 Lovely organza DARK PURPLE mini tote bag with matching ribbon on the front and a single strap handle. Perfect for you to fill with your own favours. THIS BAG IS ALSO AVAILABLE TO BUY WITH OUR PERSONALISED PRODUCTS INSIDE (pre-filled with 3 mini love hearts and 3 mini chocolate bars of your choice for £2.75).